Ruby, Sapphire and Emerald Faceted Nuggets with a vermeil rim measuring 10.7x12.7 to 11.9x14.2 mm, 9 pcs., 8.8 grams. Actual strand shown. 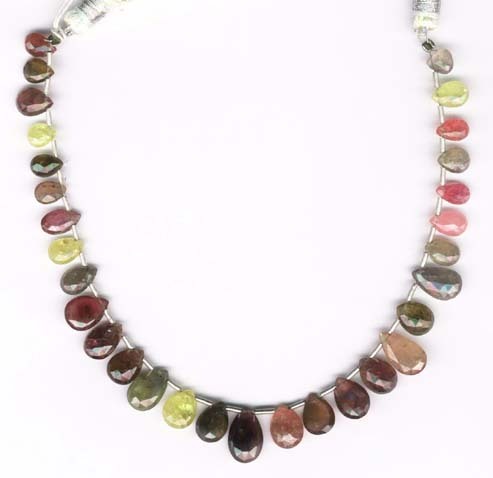 Ruby, Sapphire and Emerald Faceted Nuggets with a vermeil rim measuring 11.6x12.85 to 11.3x15.25 mm, 9 pcs., 11.8 grams. Actual strand shown. 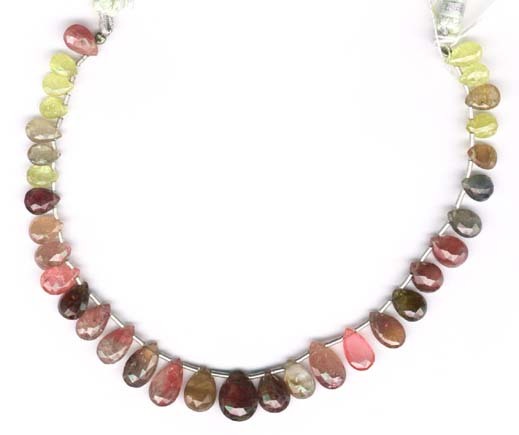 Ruby, Sapphire and Emerald Faceted Nuggets with a vermeil rim measuring 11.3x13 to 12.7x14.85 mm, 9 pcs., 11 grams. Actual strand shown. Ruby, Sapphire and Emerald Faceted Coins with a vermeil rim measuring 11.4-12.25 mm, 10 pcs., 12.8 grams. Actual strand shown. Ruby, Sapphire and Emerald Faceted Coin Drops with a vermeil rim measuring 10.55-12.95 mm, 10 pcs., 13 grams. Actual strand shown. Blue Sapphire Faceted Pears with a vermeil rim measuring 13.65x14.3 to 15.05x15.25 mm, 10 pcs., 22.1 grams. Actual strand shown. 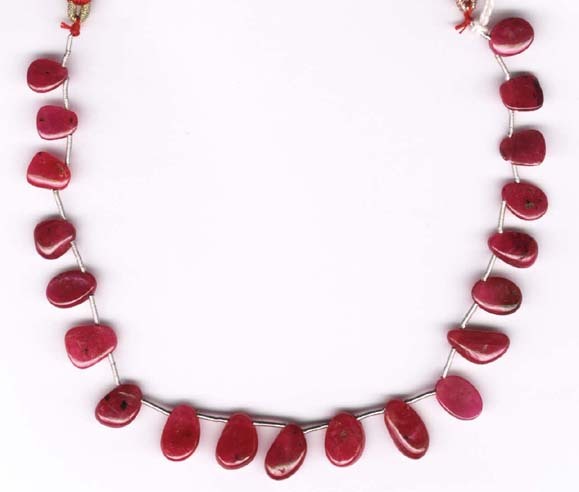 Ruby, Sapphire and Emerald Faceted Nuggets with a vermeil rim measuring 12.95x15.05 to 14.45x18.2 mm, 9 pcs., 15.5 grams. Actual strand shown. The supplier only had one bunch of these and is not sure when these would be available again. 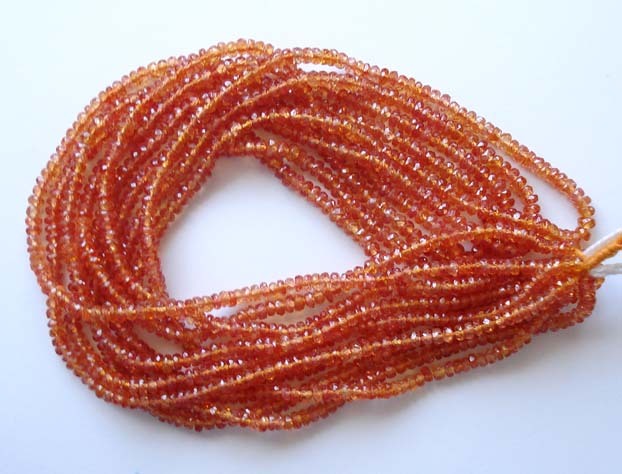 Unusual Orange Sapphire Faceted Rondelles measuring 2.7-3.2 mm, 16" strands. LAST STRAND. Large sized Multicolor Sapphire Nuggets measuring 12.2x14.75 to 12.2x20.1 mm, 25 pcs., 419 carats. Actual strand shown. 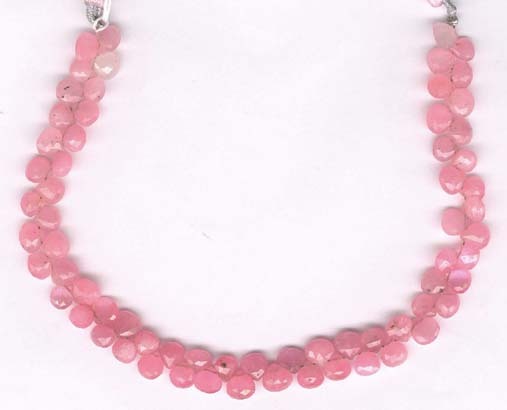 Pink Sapphire Smooth Nugget Drops measuring 6.55x7.95 to 6.95x12.35 mm, 20 pcs., 50 carats. Actual strand shown. Strongly Colored translucent to opaque Multicolor Sapphire Faceted Teardrops that are a bit 'fat' so they do resemble a bit like our onion shapes. Beads measuring 6.1x7.2 to 6.7x8.1 mm, 69 pcs. 196 carats, 8" strand. Actual strand shown. Strongly Colored translucent to opaque Multicolor Sapphire Faceted Teardrops that are a bit 'fat' so they do resemble a bit like our onion shapes. Beads measuring 5.2x5.8 to 5.8x7.15 mm, 77 pcs. 132 carats, 8" strand. Actual strand shown. Multicolor Sapphire Teardrops measuring 2.8x4.25 to 3.95x5.55 mm, 103 pcs., 60 carats. Actual strand shown above. 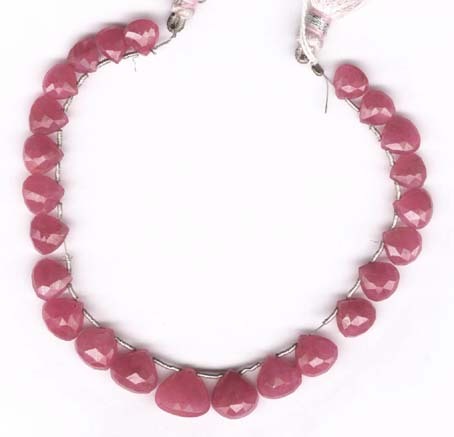 Natural Opaque Pink Sapphire Faceted pears measuring 7.6-11.85 mm, 24 pcs., 86 carats. Actual strand shown. 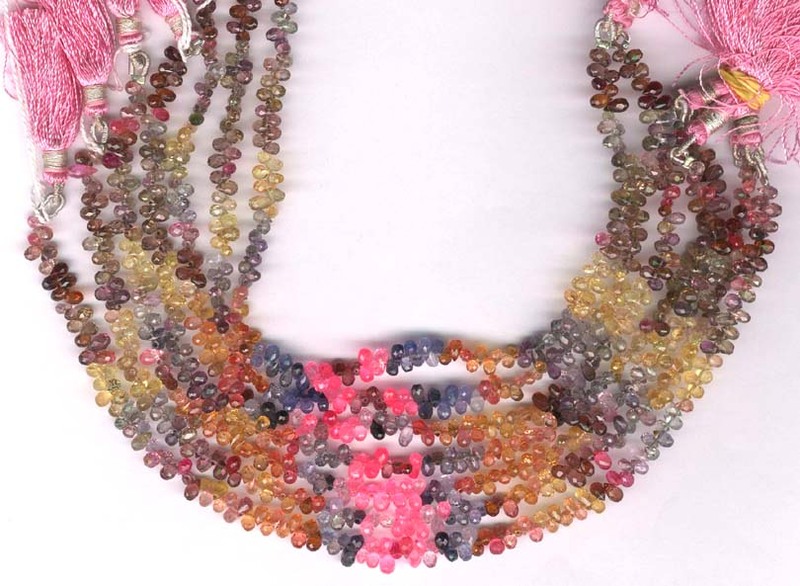 These are beautiful multicolor Sapphire Rondelles that measure around 5 mm, 16" strand. You will receive one of the strands shown. Note that because sapphire changes color when scanning, there may be some colors in the photo that are off. We have already adjusted the photo to reflect the true colors as much as possible. 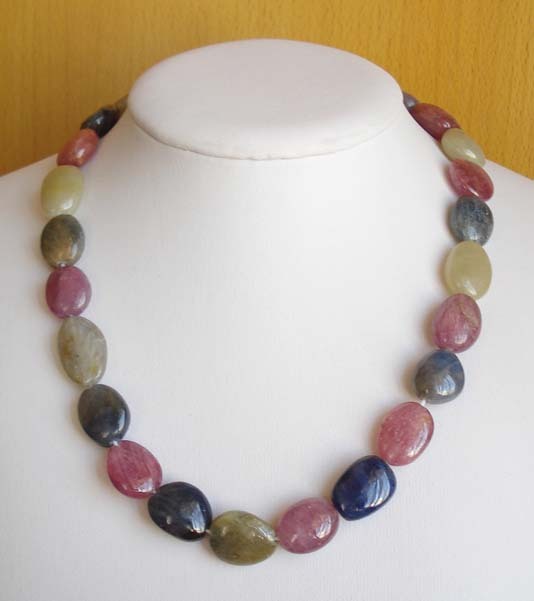 Rustic colors of multicolor Sapphire Faceted Pears with a translucent to clear quality. Beads measure 6.2-7.75 mm, 28 pcs., 45 carats. Actual strand shown. Note that because sapphire changes color when scanning, there may be some colors in the photo that are off. We have already adjusted the photo to reflect the true colors as much as possible. 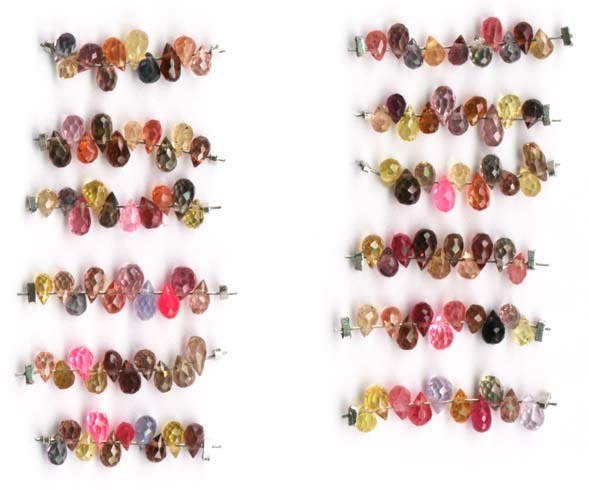 Rustic colors of multicolor Sapphire Faceted Pears with a translucent to clear quality. Beads measure 8.45-11.3 mm, 20 pcs., 76 carats. Actual strand shown. Note that because sapphire changes color when scanning, there may be some colors in the photo that are off. We have already adjusted the photo to reflect the true colors as much as possible. 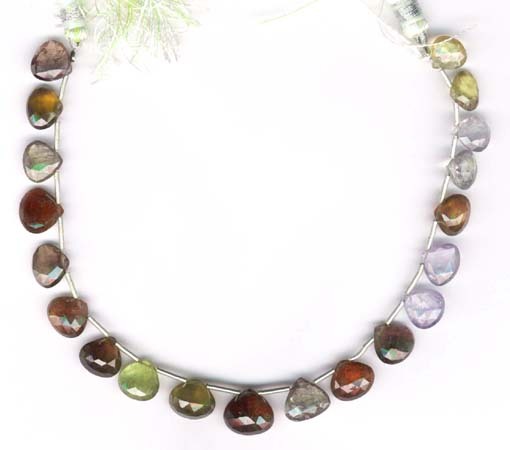 Rustic colors of multicolor Sapphire Faceted Briolettes with a translucent to clear quality. Beads measure 5x6.6 to 8.75x11.45 mm, 33 pcs., 62 carats. Actual strand shown. One of the smaller yellow beads has a small dent. Note that because sapphire changes color when scanning, there may be some colors in the photo that are off. We have already adjusted the photo to reflect the true colors as much as possible. 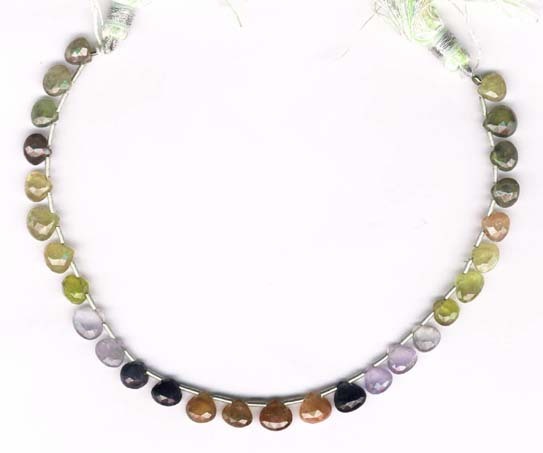 Rustic colors of multicolor Sapphire Faceted Briolettes with a translucent to clear quality. Beads measure 5.7x6 to 8x12.65 mm, 30 pcs., 65 carats. Actual strand shown. Note that because sapphire changes color when scanning, there may be some colors in the photo that are off. We have already adjusted the photo to reflect the true colors as much as possible. Wonderful clear gem quality Multi Sapphire Teardrops measuring on average 3x5 mm, at least 104 pcs, 47 carats. Note that the pink is not fluorescent as shown in the photo (color changed during the scan). Multiple strands available. 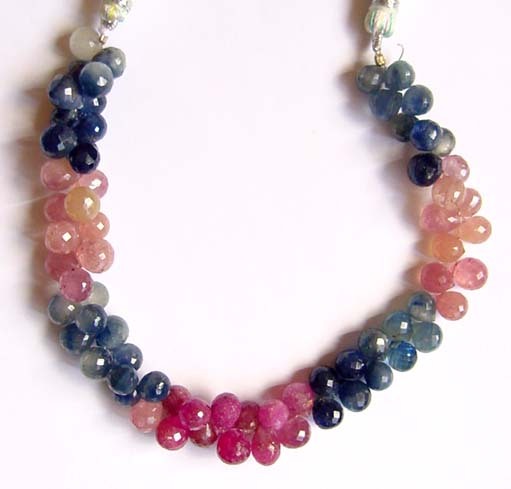 These are more colorful strands of gem Sapphire Mini Faceted Teardrops than F2291. Clear quality and bright strong colors (note that the actual pink is not fluorescent as shown - color changed when scanning). 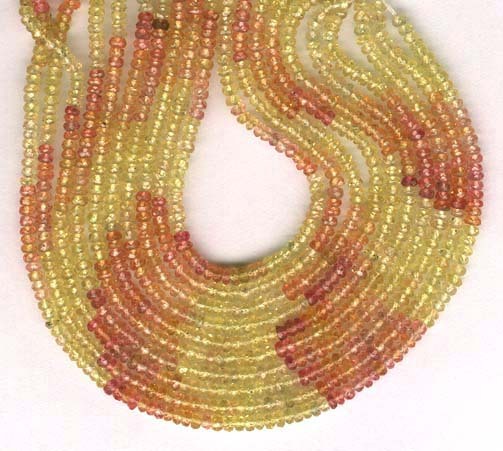 Beads measure on average 2x3 mm, around 32 carats, 8" strand. Also available as sample packs of 10 beads (see below). 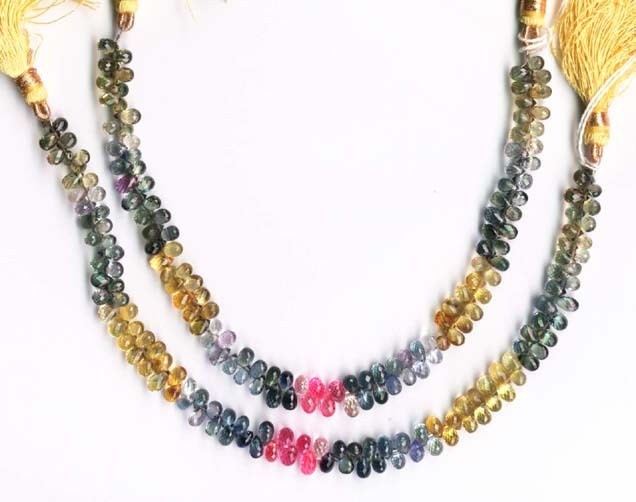 These are colorful strands of gem Sapphire Mini Faceted Teardrops (see the original strung strand in the Sapphire section). Clear quality and bright strong colors. Beads measure on average 2x3 mm, with some variation. Samples are shown above but the exact you will receive may vary. Shown much larger than actual size. 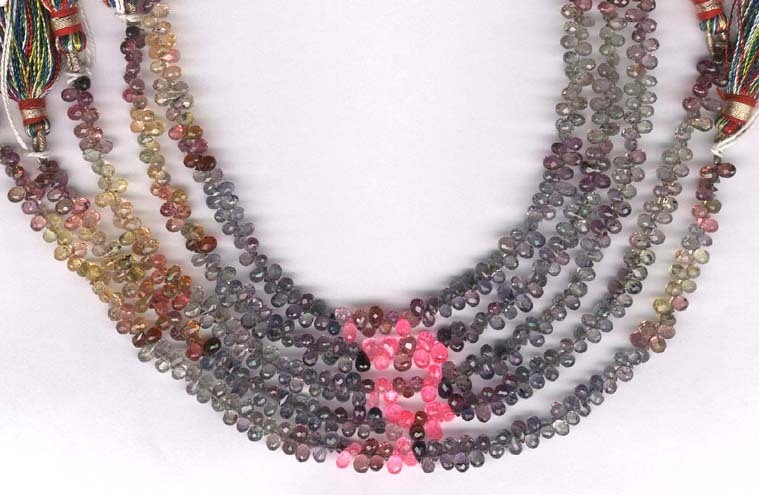 Interesting strands of teeny tiny Sapphire teardrops in a range of colors from pink (note that the actual pink is not fluorescent as shown - color changed when scanning) to grey. Similar color range to F1847 sapphire rondelles. Beads measure on average 3x4.5 mm, 32 carats, 7.5" strand. 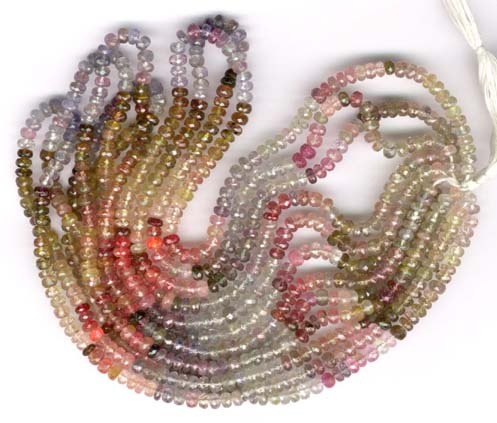 Artgems Inc are selling similar strands for around $196 on discount! 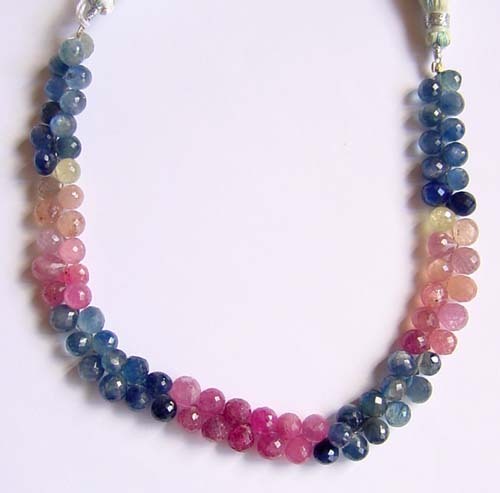 These are beautiful multicolor Sapphire Beads that measure around 3.7 - 3.9 mm, 16" strand. You will receive one of the strands shown. 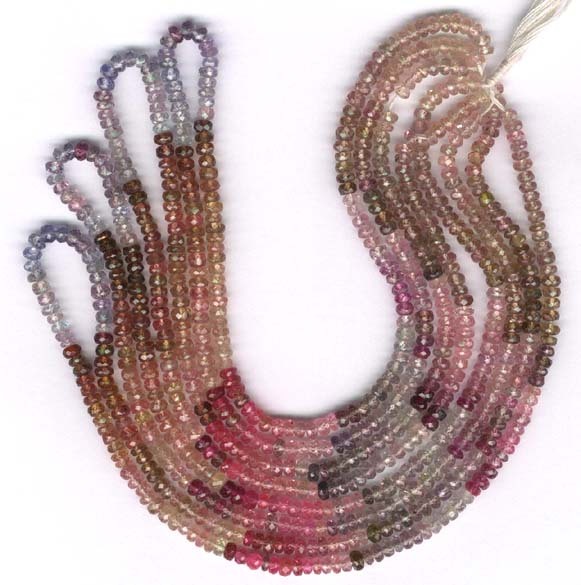 This strand measures 5-6.5 mm, 70 pcs., 73 carats. 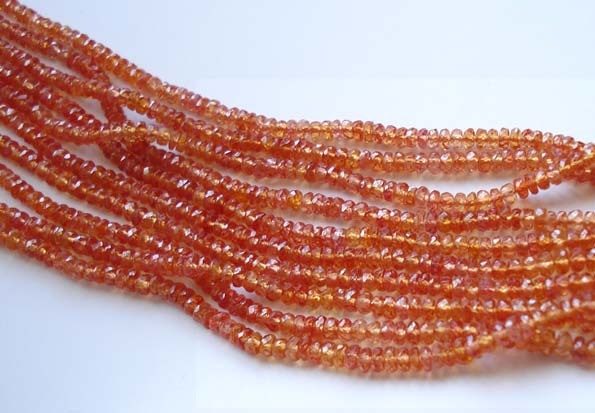 These are very rare strands of mainly Yellow Sapphire as well as shades of orange! 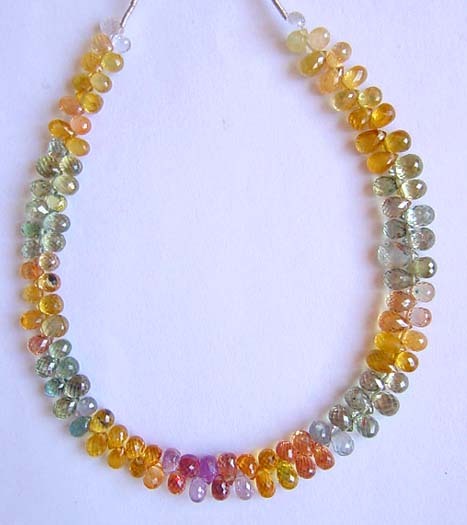 Painstakingly faceted to perfection, beads measure 3 mm, 17 " strand. LAST STRAND.